It's amazing that we've never gotten a TMZ story about what Santa does during his down time after Christmas. "Coming up, we caught Kris Kringle down in Mexico enjoying a brief siesta on the beach..." "Next up, our story of ol' Saint Nick who caught a few rounds of golf at the Masters yesterday..." "Santa spotted at the last Hamilton performance on Friday, and we've got the exclusive video up next..."
Maybe that's why Santa has never given away his true identity. We couldn't handle finding out what he does in his spare time. We'd constantly question it, wonder why he wasn't making more toys or hiring new elves to replace the retired ones, and then there'd be the gossips. "Santa's bowlful of jelly looked more like a tubful..." "He's got rosy cheeks alright...does Santa have a case of Rosacea?" "Mrs. Claus rumored to be seeking new, younger version of Santa..." Yuck. 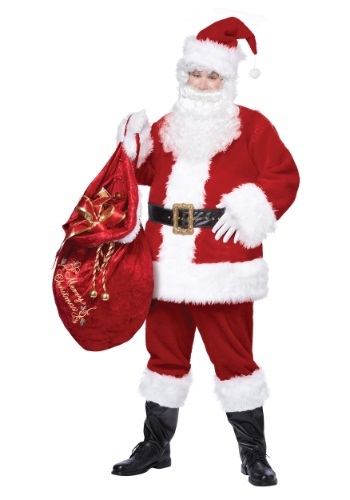 We're glad the big guy stays under the the radar, and lets other folks around the world dress up like him at malls and in movies... Our own Deluxe Santa Suit gives people that very chance.